Science and technological innovation are advancing day by day and often change our lifestyles. First and foremost, they benefit producers, although the concept of cultivation is no longer strictly connected to open fields. What used to be a simple veggie plot could potentially turn into a super-Hi Tech micro-plot that can be kept in the house. ENEA patented and developed the first microcosm for the indoor and extreme-environment cultivation of plants with a root and an aerial part (fruit-bearing trees, lettuce, basil, tomatoes, potatoes). It's a true Hi Tech field simulator that makes it possible to grow plants in environments that would usually be unsuitable for plant growth such as airports, undergrounds and shopping malls as well as in extreme environments such as the Poles, desert areas or within space missions. It replicates the growth pattern, production of beneficial properties and biomass that occurs in nature. Created in collaboration with private entrepreneur Gruppo FOS, this innovative smart-agriculture system differs from greenhouses and traditional growth chambers for a series of elements, starting from architecture, the network of sensors that monitor environmental control, plant growth and reproduction to the LED precision lighting system employing selected wavelengths. "The main innovation is the double independent chambers. One is a subterranean chamber destined to the growth of the root system and rhizosphere (i.e. organisms that live in the soil where roots grow) and the other is an above-ground chamber destined to the cultivation of the aerial part of plants and the phyllosphere (i.e. organisms living in the air)," explains Luigi d'Aquino from ENEA's Nanomaterial and Device Laboratory. Although the chambers are independent and can be managed separately, they are actually interconnected - just like it happens in nature - thanks to the geseous exchanges through the root growth substrate (soil, compost or peat). "We're currently experimenting the effectiveness of the microcosm paired with precision lighting. We have sowed and cultivated a field of basil plants of the same variety in a pot in our lab (a typically inhospitable environment for plants), in a microcosm under white light (they grew much more) and in a microcosm under precision lighting (plants developed a biomass dozens of times higher, with higher chlorophyll levels and even started the reproductive phase)." Microcosms are true ecosystems that can faithfully replicate what happens in open fields. Specific environmental conditions are set and there are organisms that interact with vegetable functions such as pathogens or parasites. Microcosms have been developed within the TRIPODE public private laboratory and are currently being developed further within the ISAAC Project, co-financed with over €4.7 million by Horizon 2020 and PON Imprese & Competitività 2014-2020 (ENEA, FOS and BECAR, a subsidiary of Beghelli, are part of it). 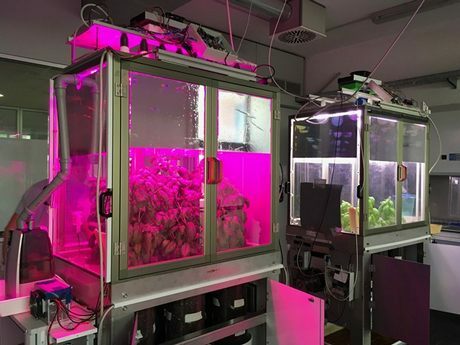 "Over the next three years, the ISAAC Project also aims at developing an innovative lighting system to effectively grow, develop and reproduce plants indoor and in extreme environments as well as supporting the well-being of human beings. We will go from a TRL 4 (Technology Readiness Level) to a TRL 7, i.e. from lab prototypes to practical application prototypes." "Our patent could be the base to develop prototypes for research labs studying plant physiology, pathology and parasites, ecophysiology, ecotoxicology and soil ecology but could also be useful to develop prototypes to promote plant cultivation in unconventional environments with excellent market and commercial potential."